My cabbage. My first seed starting success. Once so beautiful, filled with potential and cared for so meticulously. Then, something went horribly wrong. They never developed a head. Never got much bigger than pictured below. I gave a transplant of one of my starts to my grandma. 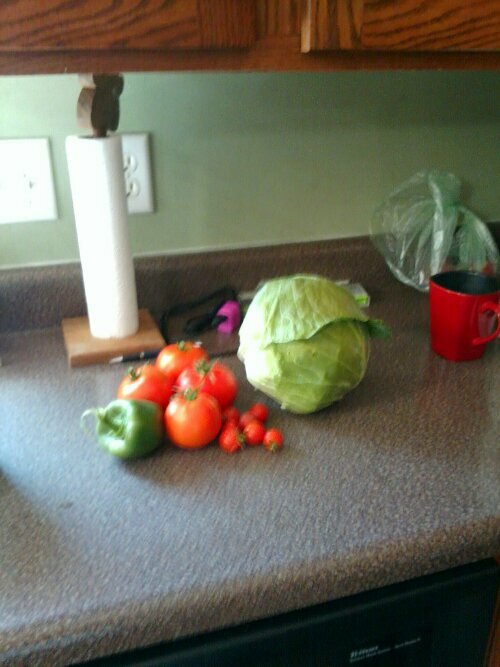 She took it home and planted it in her garden and last week harvested a beautiful, healthy looking cabbage. So why didn’t mine do as well? I blame the soil. Ok, the soil was the reason, but the fact is, I blame myself for just plopping the starts in the soil and merely watering them. I should have been fertilizing them with the nutrients missing from the soil. 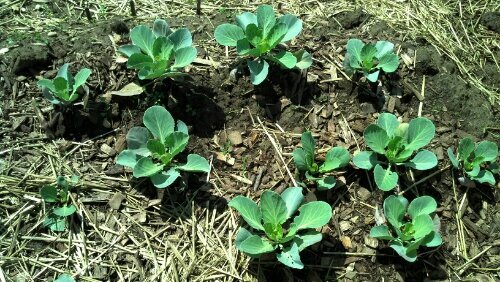 I know cabbage likes alkaline soil, which we have in abundance. I know they like nitrogen too and we fertilized with nitrogen, but not consistently. We have had some great success in our garden this year, but could have had a lot more if we had just taken the time and care to fertilize properly. If I had only watched the permaculture video on soils early on! Also, since cabbage is a leafy plant, I should have planted it in partial shade instead of out in the middle of the yard with no shade in sight. My bad. Lesson learned for next year! Afterall, this was always meant to be the year to experiment, learn and “grow” as gardeners. But then again, that will probably be every year.